A quick thank you card today that's for the CAS-ual Fridays Black & White + One Challenge and for Simon Says Emboss It Challenge. 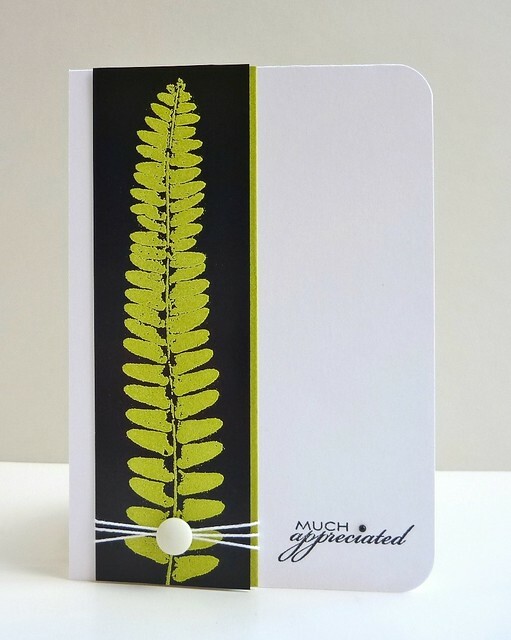 I couldn't find the right shade of green cardstock for the thin strip along the focal image so I inked up some white cardstock with Versamark and covered it with the embossing powder I used for the fern and voila, a perfect match. Gorgeous CAS card, Sue! Love your design and the fern looks so striking against the black! So many times I've had trouble finding a matching colour of cardstock - love your brilliant idea!! Love this, Sue! Gorgeous green! Gorgeous!! Love the crisp clean look...the green embossing is fantastic! !Thanks for sharing with us @ CASual Fridays this week! Outstanding! You know how much I love this already...So glad that you join the fun with us at CAS-ual Fridays! PS: congrats on your win over Hero Arts today! Ooooh, this is gorgeous! Love that leaf embossed in green, so striking! Thanks for playing along with us this week at CAS-ual Fridays! Gorgeous, actually it's stunning! Thanks for having some fun with us this week at CAS-ual Fridays! Stunning is right! I love this Sue! WOW! So very pretty! Thanks for playing along at CAS-ual Fridays! Your creative solution clearly paid off! Congratulations on your VIP status for this gorgeous card at CASual Fridays! Seems as though everywhere I look today I'm seeing your beautiful creations! Congrats, Sue! This card is beautiful and every reason why I need to heat emboss with color more often! I love it! Love your take on the challenge, Sue! Congrats on your win at CFridays!